It is certainly early in the season yet to be building Gingerbread Houses but it is never too early for ideas and for thinking “outside the box”. 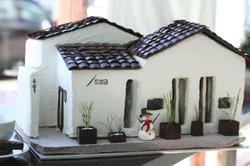 Instead of a regular Gingerbread House, why not make one of your favorite restaurant? Sona is a L.A. eatery and their pastry chef didn’t slack. He made a Gingerbread House that’s an exact replica of Sona that was displayed at the restaurant, complete with chocolate tiles and a snowman. Neat!